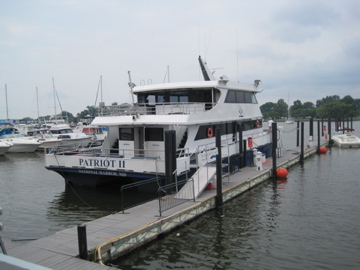 The "Patriot II" cruise ship is operated by DC Harbor Cruises out of the Washington waterfront. The boat does several tours of the DC waterfront, including a "Summertime Harbor Cruise" on Monday, Thursday, and weekends.Tickets are $18 for children, $30 per adult. Other cruises include a "Happy Hour on the Harbor" at 6 pm Thursdays through Sundays and a 90-minute "DC Harbor Lights" Crusie on selected Friday and Saturday evenings.